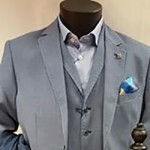 High Fashion Menswear located in the heart of Waterford City We cater for all your individual needs including: Weddings Communions Conformations and any event you are attending throughout the year. For your personal convenience we also open after hours for those unplanned events. A gift Voucher from Gregorys is the perfect gift for friends and Family. and any event you are attending throughout the year.